The original lighthouse was completed in 1825. The tower stood thirty feet high, capped with an octagonal-shaped iron lantern. The lighthouse was accompanied by a two-story keeper's house. Due to deterioration the tower and keeper's house had to be replaced. Rebuilt in 1871, the tower now stands sixty feet high and has a spiral staircase of 69 steps which leads to an observation platform. In 1925 the light in the tower (a third-order Fresnel lens) was discontinued. It was replaced by a combination light and foghorn station which was built on the west breakwater pierhead. 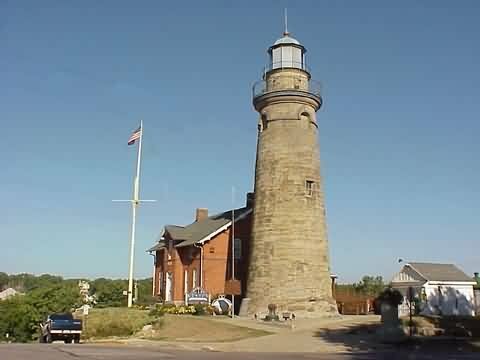 The Fairport Harbor Marine Museum was founded within the lighthouse in 1945 by the Fairport Harbor Historical Society, which is devoted to preserving and perpetuating the historic tradition of Fairport Harbor and the Great Lakes area. From the Saturday before Memorial Day through the 2nd Weekend in September..
Stay on SR-535 for 1.5 miles. At that point SR-535 will go to the right. Continue straight on East St.
Take East St. for 0.5 miles and take a left onto 2nd St.